How an illness inspired love, touched lives and changed the world. 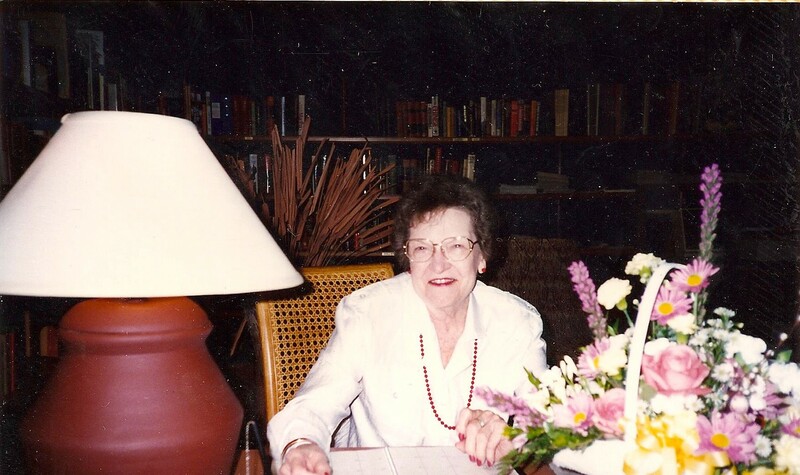 My grandmother, affectionately known as Mimi, was an amazing woman. She was an identical twin, held two masters degrees, taught and loved children throughout her career as a teacher, including me. She would read me stories as a child, let me rummage through trunks of old dresses in her walk-up attic. She played the piano, taught me manners and inspired me to be the best version of myself. I grew up and she began to grow old, but our connection was always strong . She and my granddad came to see me graduate from U.S. Navy boot camp in 1987. Six years later, she took care of my daughter at night while I took night classes to get my own college degree. She was my cheerleader, and I hers. She taught me how to love myself. Mimi lived the last 20 years or so of her life in an independent-living community. She absolutely loved it. She also continued to grow older there. I spent more time with her as her strength and memory began to fade. I saw her at least four days a week, helping her with groceries, sectioning out her medications and seeing her laundry was done. We talked every night. One weekend, I went with my husband to see his family in St. Louis. I had informed the office where my grandmother lived, letting them know I would be gone all weekend, through Monday. Because she lived in an “independent living” situation, no one was required to check on her, so they didn’t. Tuesday morning I woke up to a phone call, telling me my precious Mimi was en route to the local hospital. She had fallen Saturday night and wasn’t found until Tuesday morning. It was horrifying. I rushed to the hospital where I found her dehydrated, confused and in need of cleaning up. It was clear she would not be able to return to her apartment. I began making calls and visiting nursing homes. Mimi didn’t have much money left, because like me, she loved to spend. Her options were limited. I put her in the best facility I could find, one less than a mile from my home. When her confusion cleared, Mimi was deeply angry with me. It was a month before she would speak to me. As the months passed, I watched Mimi disappear as she retreated into dementia. Her condition was beyond my control. Day by day, I lost pieces of this woman who was my life. Two things saved me during the approximately four years Mimi spent in the nursing home, God’s Grace and God’s Mercy. In His Grace, He gives me His best, even though I don’t always deserve it. In His Mercy, He doesn’t give me what I often deserve. Instead His Mercy was a balm for my broken heart. In His grace, he gave me a daughter, by the same name. Grace is a loving, empathic, beautiful young woman. At the time my grandmother went into the nursing home, she was in fifth grade. Grace was always the kid who couldn’t make friends or keep them. She was awkward at school, unsure of herself. But she loved her Mimi. I had a hard time in the beginning, after after admitting her to the nursing home, and as I said, my grandmother was deeply angry with me for putting her there. My daughter Grace, age 10, was the only person she wanted. We lived within a mile of the nursing home. Grace would go nearly every day. She would read to Mimi, do her hair and makeup, take her for walks and in general, kept her entertained. She also began to develop relationships with other residents. If Mimi was sleeping or tired, Grace would let her rest while she found another resident she could spend time with. With time, my grandmother got over her anger, although she never accepted the place she was in. She always thought at some point she would go home. Mimi couldn’t stay mad at me, so it wasn’t long before Grace and I were visiting her together. As Grace became a common fixture at the nursing home, she began to change. She gained self-confidence, developed empathy and she was able to be of service to others. She became a stronger person. Grace and I grew closer during Mimi’s illness. We were less like mother/daughter, and more like friends, able to commiserate when things were tough and to share our joy on the days Mimi would have a clear mind. Those days were the best! On the last day when my grandmother, 98, was withered and cold, God took her home before Grace and I could get there. The nursing home called and told me I needed to come immediately, but we arrived five minutes too late. He knew I wasn’t going to make it on time, so God sent an angel for Mimi. One of my closest friends at the time was at the nursing home working and when Mimi became distressed, my friend Brandi went and stayed with her until the end. I understood at that moment how deeply and passionately we crave and need loving, meaningful relationships. Grace’s relationship with me was indescribably wonderful, her’s with Mimi obtained a depth I’d not thought possible. Then there are the other residents and staff who were touched by Grace’s devotion. Everywhere she went, she spread love. She made an intolerable situation bearable for everyone involved. She hugged people. She built relationships. She gave hope to the hopeless. Grace changed the world for the people she touched. Don’t ever think one person can’t change the world. Ever. Now more than any time in our history, we need to reach out in love as Grace did. We might not be able to change the whole world, but reaching out in love, we might change someone’s life. Love is contagious. The more we reach out in love, the more we have. Sharing our love multiplies it! It’s easy to get trapped in the day-to-day monotony life often becomes. Go to work. Go home. Mow the grass. Buy groceries. Clean the house. None of these activities by themselves inspire much of anything. It’s the relationships we develop in the process that matter. They give our lives purpose and meaning. We see friends at work, some of whom become family. At home, if we are fortunate, we spend time with a family we love. I see my neighbors when I mow the grass. I run into friends while grocery shopping. In the end, it doesn’t matter what your outside life looks like. It’s the change we make in the world by our presence. The change Mimi made in my life and Grace’s, the change Grace made in Mimi’s and so many others, the change my friend Brandi made for all of us when she comforted Mimi as God called her Home, this is what we build our lives on. Change doesn’t occur all at once. It’s through a series of small actions taken over time we can change ourselves and ultimately, the world.